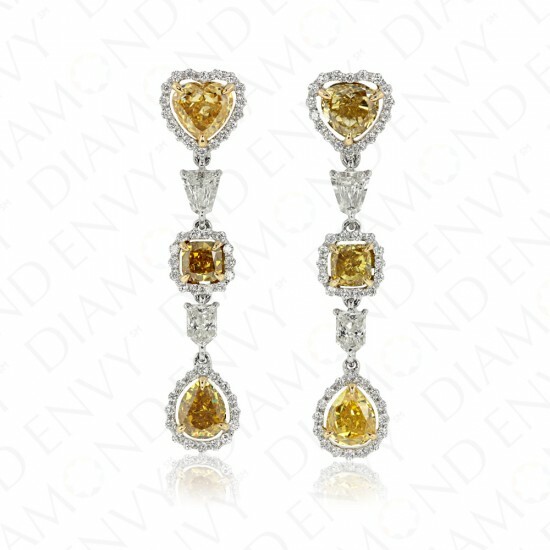 These dainty yellow diamond earrings are the perfect marriage of color and whimsy. Set in 18K two-tone gold, each canary diamond earring consists of heart-shaped, cushion cut and pear-shaped VS2-SI1 Fancy Yellow diamonds each framed by a halo of F-G VS2-SI1 accent diamonds. Two H VS1-SI1 bullet-shaped diamonds alternate with the trio of fancy yellow diamonds. Natural yellow diamonds total 6 pieces, 2.72 ct. tw. Bullet shape diamonds total 4 pieces, 0.57 ct. tw. White diamond accents total 96 pieces, 0.36 ct. tw. Gold weight: 5.35 grams. These natural yellow diamond earrings are house-graded.